We go through a lot of basic school supplies at General Academic, a tutoring and test prep company in Houston. And every time I go to purchase these supplies, I get overwhelmed with the variety of brands and vendors. It’s tempting to just walk into Office Depot and pick from their fairly large in-store selection, but we all know that’s not a very financially prudent decision. I’m one of those people who loves a good deal. I hate buying something knowing that somebody else paid less. I’m always looking at websites like slickdeals.net, ebates.com, or secretflying.com, but these types of websites rarely cover such mundane purchases as pens and pencils. So for my and your benefit, I finally sat down and compared prices in a good old-fashioned spreadsheet on July 27, 2018. While I spent hours doing this analysis, you’ll be able to save hundreds in just a few minutes and clicks after this quick read. Know how much something should cost. I didn’t know what the bottom dollar price was on these items before I did this analysis. After you figure out your baseline cost and place that first order, use your store’s reorder tool so that you don’t have to start all over every time; just make sure that the reorder price is similar to what you originally paid. Don’t assume off-brand is the best value. 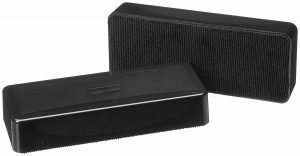 With all of the items on my list, I usually found at least three or four different options ranging from the big brand like “Expo” to the store brand like Amazon Basics. Usually I don’t mind buying off-brand for consumables, but I was pleasantly surprised to find that the store brand wasn’t always the cheapest (like those Expo markers again)! So don’t automatically make the assumption that off-brand means cheaper or better value. Save another 20% or more with shopping portals, credit cards, and memberships. 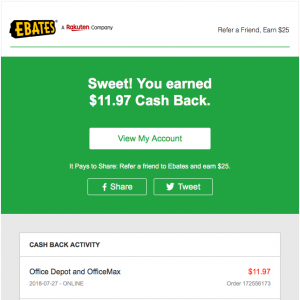 I saved almost another 20% ($80 on this go around) by shopping through a cash-back portal, collecting my credit card points, and just signing into my free Office Depot rewards account. Also, my credit card (Chase Ink Business Plus) earns me 5x points on purchases from office supplies stores. Maximizing credit card points is a whole different blog post, but just know that I value those 5x points at about 10% back or 2 cents per point that I’m going to later use to take a free trip somewhere cool. Finally I got one last bit of extra value at Office Depot by simply being part of their free rewards program, which gives 2% store credit back. Let me make one quick gripe about unscrupulous coupons. Sometimes I make purchases at Quill.com, a division of Staples. I generally like Staples and Quill and can get some good values there with their coupons, but what I don’t think is right are Quill’s “free gift” coupons. 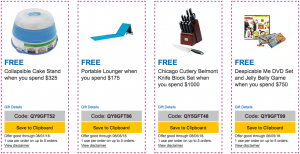 For example, in lieu of saving $100 off of a $300 purchase, you could get a “free” set of knives or a “free guacamole and salsa container.” These types of coupons are clearly targeted at institutional buyers who care more about self-serving frills than saving money for their school or company. So if you see a lot of crap starting to appear in the office of your admin, take a closer look at their invoices. 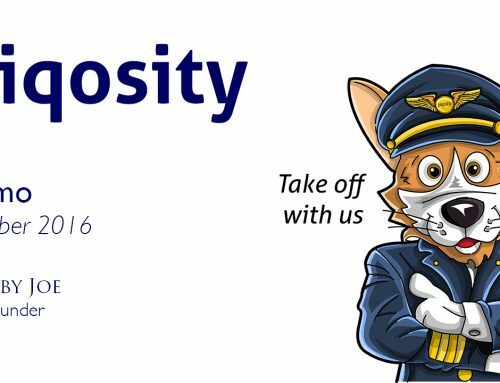 Or if you’re that person who’s using those “free gift” coupons, make sure to hide your swag at home! The lowest price I found for a good old-fashioned number two pencil was 6.2 cents each for Dixon Economy pencils at Wal-Mart. 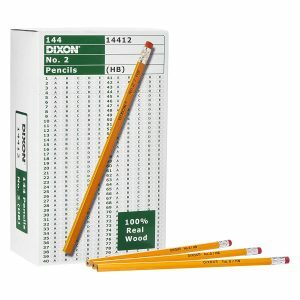 These pencils are un-sharpened and are sold in a box of 144 for $8.90. The next closest in price were Amazon-brand and Office Depot-brand pencils at 8.3 cents each. Now if you’re into the “luxury” number two pencil that is Ticonderoga, the lowest price I found was at Costco (in-store only) at nearly 10.9 cents each! A lot of you may have strong feelings about pencils – no one likes the ones that constantly lose their tips in the sharpener – but I don’t know if I feel good paying nearly double for Ticonderogas that a kid is just going to throw at my ceiling or bite in half. 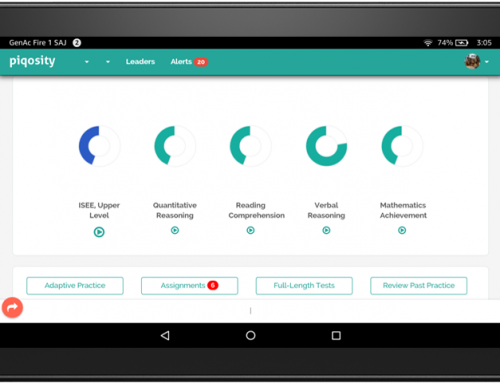 Our students write a lot of practice essays for tests like the SAT, ACT, and ISEE. For this portion of the test, they push their Dixon economy pencils aside and pick up a pen. I personally like the “stick” style pens, because they’re cheap, write well, and don’t smear. 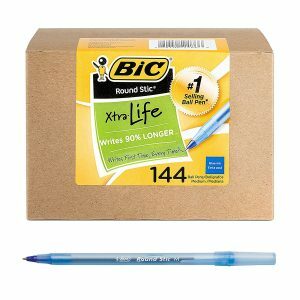 The lowest price I found for a stick pen was 6.5 cents each for a Bic Stic Xtra Life at Amazon. Office Depot had a strong showing at 6.7 cents, but Wal-Mart wasn’t even trying at 8.3 cents, and Costco only had Papermates for 10.8 cents. 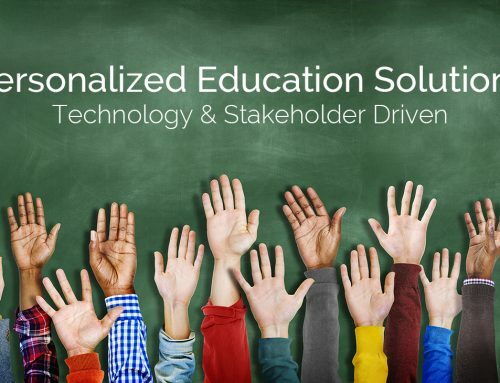 Expo markers are like the Rolls Royce of dry erase markers; they’re the gold standard. 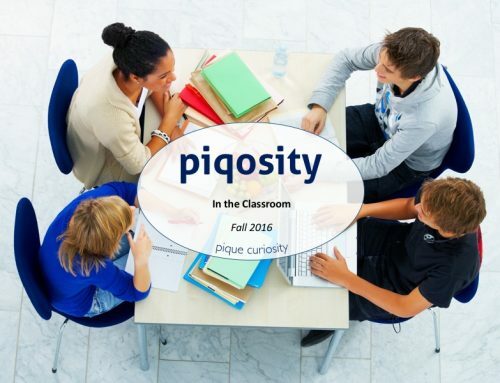 When students see that you’re writing with Expo, they sit up and take notice. And if you make the mistake of just walking into your neighborhood office store, you’ll easily shell out over a dollar per marker. 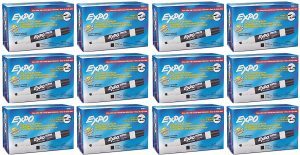 The lowest price I found for dry erase markers were Expo 8001 “chisel-type” at Amazon for a pleasingly low price of 48.6 cents each when you buy 12 packs of 12 markers for 144 for $70. Now if you’re just buying for your classroom you might be thinking, “woah, I don’t need 144 markers!” But you’re in luck, because at Amazon, you can find almost any quantity for less than 60 cents per marker. It’s worth noting that Expo isn’t the only game in town. Wal-Mart will sell you Bic dry erase markers for 55 cents each, and Office Depot had their store brand on sale for 60 cents each. But if you find yourself with Expo costing the same or less than the other brands, you know you want the Expos. At our office we have a lot of glass-top tables. The students and tutors love these surfaces, because they can draw all over them with dry-erase markers. But the chisel-tip Expos are a little unwieldy for this much smaller, closer-surface; therefore, I decided to get some fine tips. 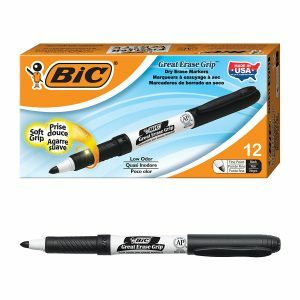 The lowest price I found for fine tip dry erase markers were Bic “Great Erase Grip Dry Erase Marker” at Amazon for 54.3 cents each when you buy a 12-count for $6.52. By comparison, the Expos were 63.7 cents each. If you’re too posh to just use your hand or an off-brand paper towel, you’re going to also want to buy some whiteboard erasers. The lowest price I found for whiteboard erasers were hard-plastic Amazon-brand erasers for $1.37 each when you buy an 8-pack for $10.99. 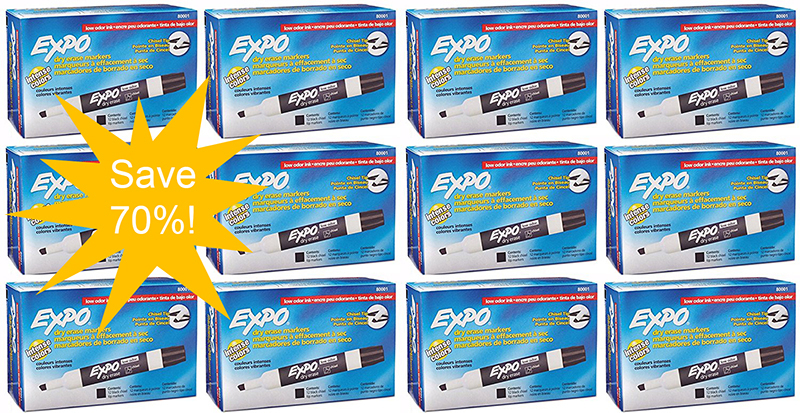 You could also get Expo erasers for $1.44 when you buy a 6-pack for $8.63. But unlike their markers, the basic foam-body Expo erasers are actually a little cheap feeling. Because they’re foam they always get squished out of shape. Office Depot had a strong showing at $1.64 for their store brand erasers; however, these erasers have the extra benefit of being magnetic, so they’ll stick to your ceramic whiteboard (but not cheap melamine). 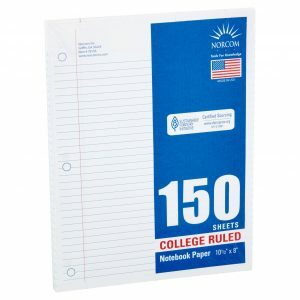 The lowest price I found for college rule filler paper was 0.50 cents per sheet of Norcom at Wal-Mart (in-store only). But if you can’t be bothered to walk into a Wal-Mart, then the next best price is Office Depot-brand paper when you buy 100-sheets for 85 cents. This is a sale price, and there’s a limit of 12 items. However, they also have Office Max paper on clearance for 1 cent per sheet when you buy 200 sheets for $2. Amazon doesn’t really want to have to pay to ship you heavy filler paper, as they’ll charge you 1.8 cents per sheet for their store brand. Ouch! Why is graph paper always so much more expensive than lined paper? Is it because it has double the amount of lines on it? 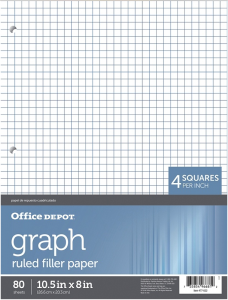 The lowest price I found for graph paper or “quad paper” was Office Depot-brand at $6.99 for 500 sheets – BUT – they took an extra 25% off to bring it down to just $5.25. By comparison, Amazon’s brand will set you back 1.8 cents per sheet and School Smart at Wal-Mart costs an eye-watering 1.8 cents per sheet (don’t make any mistakes kids)! 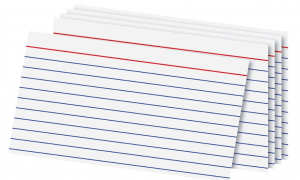 The lowest price I found for index cards or note cards were the Office Depot-brand 3″ x 5″ cards for 0.40 cents each (1/4 of one cent) when you buy 300 for $1.25. Note that this is actually 1/10 of a cent cheaper than buying the 500-pack for $2.25. Wal-Mart would be your next best bet where you could get the brand-name Oxford cards for 0.60 cents per card. By comparison, the Amazon brand cards were a whopping 2.9 cents each, but these are advertised as “heavy weight” and the Oxfords were 1.2 cents each.